A thunderous roar filled the large room on the ground floor of the S.H. Kress Building in downtown Hilo, forcing audience members to cover their ears. On the projection screen, a space shuttle rode a pillar of fire through the atmosphere and into space. "So, how'd you like to get to work in that?" asked Lt. Col. Carlos Noriega, prompting applause. 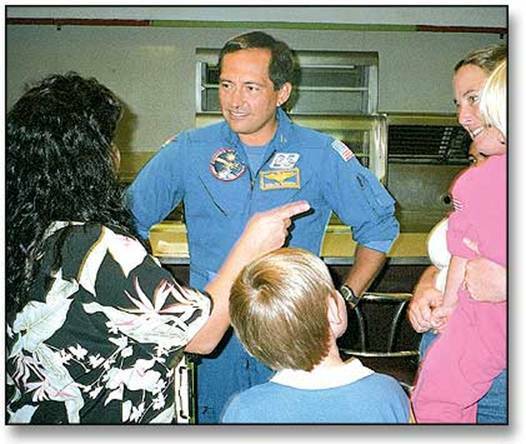 Noriega, a veteran of two space shuttle flights, spoke Wednesday at Connections Public Charter School's open house. He gave a slide show, passed out samples of astronaut food and answered questions about the future of human space flight. Student Jared McLean, 7, asked Noriega how it felt to be weightless. "Weightlessness is a lot of fun," he said. In the absence of gravity, however, he had to rethink simple tasks such as opening and closing doors, he said. Another student asked how the stars and planets looked in space. "It's actually much better to drive to the top of the mountain," he said, referring to Mauna Kea. The thick glass of the space shuttle windows, along with the bright lights inside the shuttle, make stargazing from space difficult, he said. The students peppered Noriega with questions: How fast do you go? Have you ever been scared in space? What's the number of women astronauts? How close have you been to the sun? Finally, someone asked: "When are we going to fly again?" "When it's safe to do so," Noriega said. The space shuttle fleet has been grounded indefinitely since Columbia broke apart during re - entry Feb. 1, killing the crew. Three of Noriega's classmates - Rick Husband, Michael Anderson and Kalpana Chalwa - died in the accident. "The immediate future is to get back to flying and building the space station," Noriega said of the space program. Mars, the ultimate goal, will require an international effort, he said. "It's very expensive. But it's worth it," he said. Born in Lima, Peru, in 1959, Noriega graduated from the University of Southern California in 1981 with a bachelor's degree in computer science. He joined the Marine Corps, flying helicopters as part of a peacekeeping operation in Lebanon. Returning to school in 1998, Noriega received two master's degrees from the Naval Postgraduate School. NASA selected him for astronaut training as a mission specialist in December 1994. Noriega's first flight on the space shuttle, STS - 84, took him to the Russian space station Mir in May 1997. Returning to space aboard STS - 97 in December 2000, Noriega made three spacewalks to install and unfold a pair of 110 - foot - long solar panels on the International Space Station. His next flight, STS - 119, will install one critical electricity - generating component on the space station and relocate another. That mission will come about a year after space shuttle flights resume, he said. Space flight is inherently risky, said Connections Principal John Thatcher, Noriega's brother - in - law. "They knew and they wouldn't have had it any other way," Thatcher said, referring to the astronauts. Noriega, 43, was visiting Hawaii from Santa Clara, Calif., for a family reunion, Thatcher said. While on Oahu, Noriega met Gov. Linda Lingle and sent a birthday greeting to colleague and former University of Hawaii instructor Ed Lu, who is now aboard the space station. Noriega stressed the importance of doing well in school and excelling in math and science. Thatcher estimated about 200 people attended Noriega's speech, including student Sarah Erickson, 7. "I thought it was good," she said. "And someday I might go up there."